As mentioned in the last post, 670 sales were recorded in the District in January 2007. 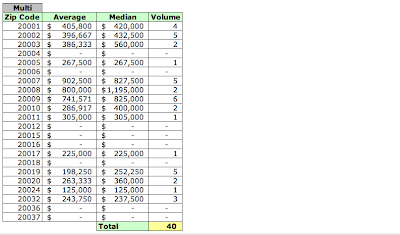 The figure on the right list those sales, organized by zip code. 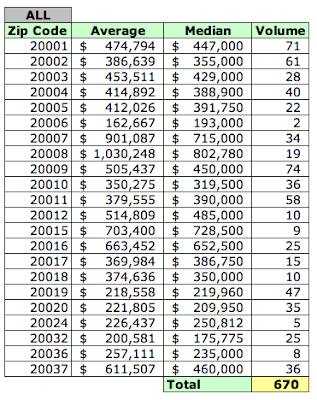 While zip codes 20008, 20007, and 20015 continued to have the highest average price, the sales action was in zip codes 20009, 20001, and 20002, which recorded the highest sales volume by units. 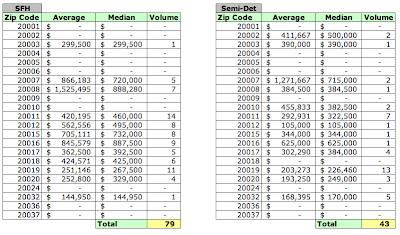 Condos drove the sales in zip codes 20009 and 20001, representing 79.73% and 77.46% of sales in each in January. 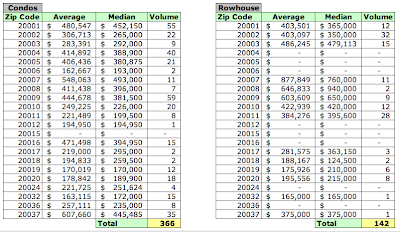 Rowhouses had a 52.46% share of the sales in 20002. In the condo market, 20009, 20001, and 20004 were the top three zip codes in sales volume, constituting about 30% of all recorded condo sales. For the latter two, this can be attributed to the closings of units in The Whitman, the Sonata, and Rhapsody  and The Artisan . No single building drove sales in 20009. I don't know why I'm still surprised by this, but units in the Sonata are already being advertised for rent on craigslist; a 1/1 for $1950 and unit #905, a 2/2 with stunning sink hardware for $2600 [JUST REDUCED]. The paint is so fresh on this one that its sale hasn't even been posted by the District yet.